With a stay at Mantra on the Quay, you'll be centrally located in Brisbane, within a 5-minute drive of Story Bridge and Eagle Street Pier. 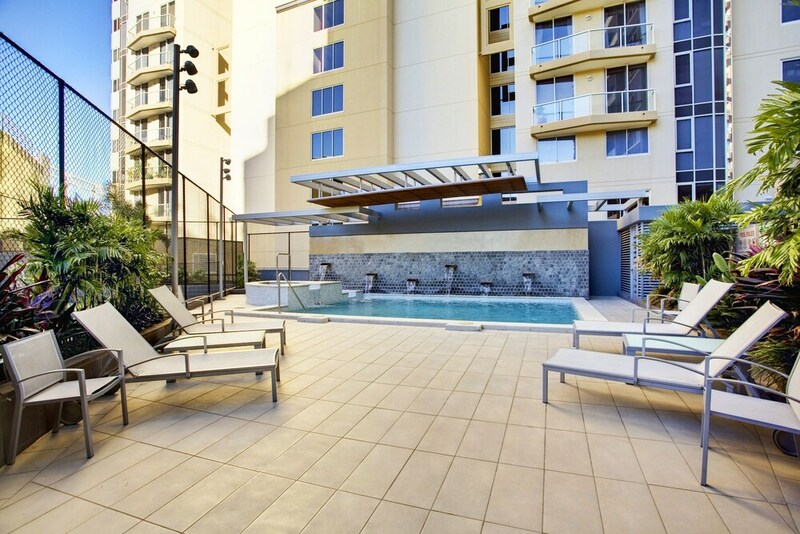 This 4.5-star apartment is 0.9 mi (1.4 km) from Queen Street Mall and 0.9 mi (1.5 km) from Brisbane Botanic Gardens. Make yourself at home in one of the 64 air-conditioned rooms featuring microwaves. Wireless Internet access (surcharge) is available to keep you connected. Partially open bathrooms have deep soaking bathtubs and complimentary toiletries. Conveniences include phones, housekeeping is provided weekly, and you can request cribs/infant beds (surcharge). Don't miss out on the many recreational opportunities, including an outdoor pool, a spa tub, and an outdoor tennis court. Additional amenities at this apartment include complimentary wireless Internet access, tour/ticket assistance, and barbecue grills. Grab a bite from the grocery/convenience store serving guests of Mantra on the Quay. In addition to an outdoor pool, Mantra on the Quay provides an outdoor tennis court, a spa tub, and a sauna. Wireless Internet access is complimentary. This luxury apartment also offers a fitness center, tour/ticket assistance, and barbecue grills. Onsite parking is available (surcharge). Mantra on the Quay is a smoke-free property. Book a minimum 2-night stay in a valid rate plan displaying the "Free Wi-Fi (per day)" green tag for travel now - October 4, 2019, and receive 1 GB of free WiFi per day. Must book valid rate plan displaying the "Free Wi-Fi (per day)" tag to receive benefit. Minimum 2-night stay required. Full details at check-in. Offer subject to availability. Offer is not valid with groups/conventions and may not be combined with other promotional offers. Other restrictions and blackout dates may apply.